For this segment it’s time to look at the “Universal” Mythic Abilities – the options that any “Mythic Character” can take. Beyond Morality: You have no alignment. If an effect is alignment-based, you’re treated as being of the most favorable one for you. This one is pretty easy to build. Immunity/Alignment Energies (Common, Major, Minor – since the forces that cause you to have an alignment are pretty subtle, 6 CP). Divine Source: You may grant divine spells. You gain two Domains – your alignment domains unless you’re Neutral, in which case you may select freely. Each day as a spell-like ability, you can cast one spell of each level equal to or less than your tier chosen from among your domain spells. At tiers 6 and 9 you may select this again, adding a domain and two subdomains each time. Before building this ability, it’s necessary to note a poor design decision in the original rules. The basic Mythic rules let you pick up Beyond Morality – a fine choice in itself, since it protects you from Holy or Unholy damage as appropriate, from quite a few spells, and from a variety of other troubles – and then take Divine Source – gaining a free choice of two domains. Of course, you can always propose new domains or pull them from obscure sources. A spell-like ability has no verbal, somatic, or material component, nor does it require a focus or have an XP cost. The user activates it mentally. Armor never affects a spell-like ability’s use, even if the ability resembles an arcane spell with a somatic component. It has A spell-like ability has a casting time of 1 standard action unless noted otherwise in the ability or spell description. In all other ways, a spell-like ability functions just like a spell. They are subject to spell resistance and to being dispelled by dispel magic. They do not function in areas where magic is suppressed or negated. Spell-like abilities cannot be used to counterspell, nor can they be counterspelled. So you can pick up access to two spells of each level one through nine and use one of them of each level up to your current tier each day as a spell-like ability. Admittedly it’s in two thematic lists – but there are a LOT of thematic lists out there. That’s pretty obviously a great deal better than – say – spending two of your choices on picking up “Commune” and “Plane Shift” once per day each, or Darkvision (there are fairly cheap spells and items for THAT), or the ability to speak all languages (get a Tongues spell) or some such. So we either assume that pretty much EVERYBODY takes this (and simply reduce the number of choices by two and build it into the base template abilities) or we let the price go up some. So lets take a look at the price of building it. Dominion and Manipulation, Specialized and Corrupted/only as prerequisites (4 CP). Sphere of Influence x2, Specialized (for Increased Effect; your clerics may draw spells of up to your Tier from you without your having to withdraw to an outer plane) and Corrupted/does not reduce spell levels for you or provide awareness of events within your sphere of influence (8 CP). To pick up additional Spheres of Influence according to the original rules, buy them at 6 CP each – with the Corruption going to acquiring two subdomains from those that go with the basic sphere of influence. Godfire, Specialized and Corrupted/does not actually allow the user to collect or expend godfire or provide any side-benefits (2 CP). Divine Attribute, Specialized and Corrupted for increased effect (the character remains in control)/does not provide near-limitless power, rather the user may, each day, as a spell-like ability, cast one spell of each level equal to or less than your tier chosen from among the domain spells that your spheres offer to your Clerics (6 CP). Personally, I’d insist on a substitute for any domain that offers access to Gate, Miracle, Wish, or any other spell that’s primarily controlled by it’s massive costs. This one is more than a bit of a stretch simply because the mathematics is wonky anyway; there’s no reasonable way to decide just how much power a Specialization and Corruption on infinite power should let you have – and an “increased effect” that lets you gain control of something infinite, even if it is reduced in the process is just as unreasonable. I’m going to blame it on Mythic Power and Reality Editing this time – but I wouldn’t allow this anywhere else. Throw “reliant on the user having Mythic Power to maintain control” in with the other limitations there. 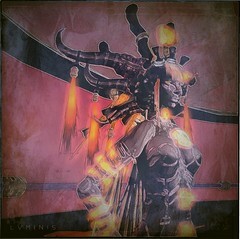 Transcendence (Corrupted/only applies to Mythic Template abilities, 4 CP). This lets you ignore things like “level requirements” in favor of simply using your tier – since there’s nothing that actually prevents a low level character from having a high Tier. That’s a grand total of 30 CP on this one – the price of five normal feats. Like it or not, this represents quite a lot of power, and bringing down it’s cost that far is already a bit of a stretch. How comparable is that to the rest of the path abilities though? I’ll just have to work out more of them and find out before deciding what to do about it. Commune with Power: You can spend an hour in meditation to Commune with the source of your power. To build this one take Inherent Spell, Specialized for Double Effect / requires one hour of meditation (Commune) (6 CP). Display of (Attribute): You can spend a point of Mythic Power to get a +20 bonus on a roll based on a particular attribute. To build this one take Inherent Spell, Mana Powered Option, Corrupted for Increased Effect/limited to boosting rolls linked to a specific attribute: Moment of Insight/Skills and Checks, +3 levels to convert to a Circumstance Bonus (6 CP). Extra Mythic Feat: Get an extra mythic feat. There’s nothing to build here; spend 6 CP and buy an extra. Extra Mythic Power: Get +2 Mythic Power/Day. To build this buy more Mana, Specialized for double effect (each point counts as two) /only to power mythic template abilities, natural magic must be purchased separately and for specialized effects only (6 CP). Legendary Item: Gain a legendary item with (Tier) abilities (Maximum 3/6/10 with first / second / third purchase). “Legendary items” are generally difficult to destroy, contain a certain amount of “Legendary Power” (as opposed to “Mythic Power”, although “Mythic Power” can substitute for “Legendary Power”), must be bonded to a specific character for it’s Legendary Powers to operate, and can let it’s user power his or her “surge” ability with Legendary Power. After that, they can have a fairly wide variety of special powers. Eclipse calls items along those lines Relics – although Relics are a good deal more flexible (and potentially more powerful) than Legendary Items, since Relics can add directly to the user’s powers… Getting a Legendary Item in Eclipse is pretty straightforward; buy Create Relic, Specialized and Corrupted/only for making personal relics using points from Enthusiast, can only make a limited selection of relics (2 CP), Double Enthusiast, Specialized for Increased Effect (4 CP available) and Corrupted for Reduced Cost/the points may only be used to make Relics, creating a relic requires some associated mighty deed (4 CP). Further upgrades may mean investing more points in a relic – but Mystic Link and similar abilities may also be very helpful. Longevity: You no longer physically age and regain any physical attribute points lost to aging. Well… Immunity/Physical Aging (Uncommon, Major, Major, 6 CP). Mythic Craft: You craft things twice as fast as usual, can make them masterwork by simply paying the cost, and add your tier to skill checks associated with making magic items. This is kind of dull, but OK; take Luck, Specialized and Corrupted for Triple Effect/only for Skills, only for crafting-associated checks, only to “take 20″ in advance. Thus Mythic Crafting; you may automatically “Take 60″ on crafting-related checks. It’s only once per day, but so are such checks. Alternatively, you could take an immunity to the time normally required for crafting and multiply your speed that way, or just take Action Hero/Crafting and pull stuff out whan and as you need it. In all cases, you can buy this for (6 CP). Mythic Spellcasting: You can spend a point of Mythic Power to pump up a limited number of spell effects. Another easy one. Take Reality Editing, Specialized and Corrupted/only to amplify spells, can only be applied to (Casting Attribute) chosen spells to produce a preselected effect. Of course, doing it this way means that you can decide how Mythic Spellcasting will upgrade each of your chosen spells – and so every Mythic Spellcasters Mythic Spells will be different. Personally, I think that that’s a good deal more appropriate. Mythic Sustenance: You no longer need to eat, drink, or breathe. If targeted by something that affects you through those functions you may ignore it. That’s Immunity/Metabolic Effects (Very Common, Major, Major), Specialized and Corrupted/only covers eating, drinking, and breathing, does not protect the user if he or she voluntarily eats, drinks, or breathes (and yes, that means no talking if you don’t want to breathe) (5 CP). Pierce the Darkness: You either gain Darkvision or improve your existing Darkvision. Buy Occult Sense/Darkvision or the Improved modifier, in either case (6 CP). Enhanced Ability: Gain a permanent +2 bonus to an ability score, may be taken once per score. OK; this is a sop to the Multiple Attribute Dependent types; rather than watching as – say – the party wizard takes a +10 Intelligence while they need to settle for +4/+4/+2, they could make that +6/+6/+4 – although the opportunity cost is high and the Wizard will probably take this once for a +12 Intelligence in total. Of course, the fact that this is limited to +2 per attribute pretty much says that it’s a typed bonus of some sort. The fact that it doesn’t say what type indicates that it’s going to be an unusual one. So; Take Innate Enchantment (7000 GP Value) for (8 CP), take the usual “+2 enhancement bonus to an attribute” personal-only boosting spells (five of them, at 1400 GP each), and then throw in the Innate Enchantment modifier that converts them to another bonus type – perhaps Sacred or Profane or Alchemical or some such (+6 CP). Throw in Immunity/Dispelling and Antimagic (Common, Minor, Great, Specialized and Corrupted/only protects the innate enchantments in this template, 4 CP) and you have 18 CP for +2 to each of five attributes – a bargain for the multily-attribute dependent, but a high cost for a character who only needs one or two of those. Next up it’s an assortment of immunities – all of which fail if the source of the effect is another creature with Mythic Power. Of course, given that all serious opponents are going to be Mythic, this makes them a lot less effective than they might be… In general, either Uncommon, Major, Great (covering effects of up to level seven; I suspect that anything throwing around effects of level 8+ is going to be Mythic anyway) (6 CP), or (Common, Minor, Great) (also 6 CP). Listed immunities include Fear (Common, Minor, Great), Diseases and Poisons (Common, Minor, Great), Curses and Compulsions (Uncommon, Major, Great), Blindness and Deafness (Uncommon, Major, Great), Petrification and Polymorph (Uncommon, Major, Great), and Sleep (Common, Minor, Great). If you want, call them Corrupted for Increased Effect (covers effects of up to level eleven)/not versus powers originating from “Mythic” sources. Ultimate Versatility: Once per day you may temporarily change one of your past choices about a class feature. Farwalker: You can plane shift once per day. Taking this twice provides three uses/day. For this one take Channeling 1/Day, Specialized/only for spell conversion (1 CP) and Spell Conversion to a L5 effect (Plane Shift), Corrupted/cannot be powered by normal channeling (6 CP). OK, this one costs 7 CP for the first instance – but only another 2 CP to get it up to the three times a day version. Mythic Presence: You may spend a point of Mythic Power to frighten those nearby, affecting non-mythic creatures much more severely than Mythic ones (Panicked/Shaken versus Unaffected / Shaken if of lesser Tier, totally unaffected if of higher Tier). Buy Presence (Fear), Specialized and Corrupted for Increased Effect (30′ radius and add Tier to base 10 + Cha Mod save), only works for one minute on a point of Mythic Power rather than being continuous, limited in effects by Tier (as above). Mythic Sight: Gain 30′ blindsense. If taken twice you can detect illusions and magical deceptions as if using true seeing . This ability doesn’t work against illusions and magical effects that were cast by other mythic creatures or that are affecting other mythic creatures. Another easy one; Take Occult Sense/Blindsense (6 CP) then Improved Occult Sense/Illusions and Magical Deceptions, Specialized/does not work against effects that originate from or are on “Mythic Creatures” (Another 6 CP). Tongues: You can understand and speak any language, as the tongues spell. Take Presence (Comprehend Languages), Specialized and Corrupted for Increased Effect (all languages in a wide radius)/only works on you, does not allow reading languages (6 CP). Hm… At this point, virtually all the universal mythic abilities except the divine powers and the multiple attribute boost work out to six character points – just the same as a normal feat. Since the multiple attribute boost normally took several choices, that works out nicely, but the divine powers may just have to wind up as a part of the general framework. I really can’t see too many characters passing them up – especially when, in Eclipse, you can buy most of the other powers outside of the Mythic Template if you feel like it. Don’t even have to blame Mythic for that in particular. Math with infinities always feels a bit wonky. It is necessary to deal with some abilities at times (again, looking at Immortals Handbook, for example) because they can’t be replicated in other ways (or become so expensive as to be a very unwise choice). I mean, I guess one could always throw in a Natural Law Immunity (Inability to case spells from your domains as spell-like abilities, specialized to only work once per day per spell and only if your “Mythic Rank” is high enough, Major/Major/Epic), but I’m not sure if that approach would be more or less wonky. Oh yes. Trying to mix finite and infinite quantities in your math never really works right. I do blame Mythic for making a couple of their abilities so much better than the rest that they’re blatant “must have” options though. It’s rather sloppy design.